Hi dolls! 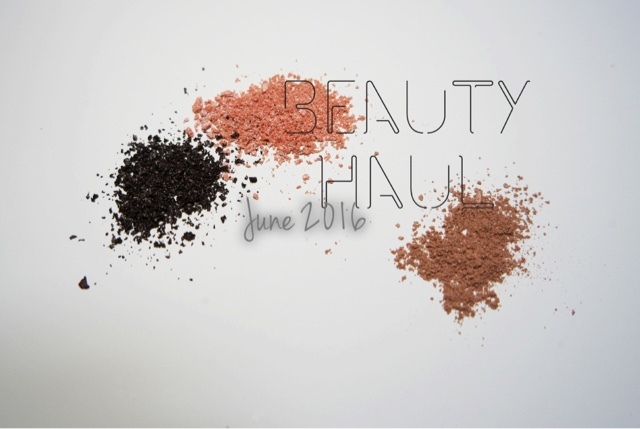 Today Ive got a little beauty haul to share. Zoeva is a brand that have been on my radar for quite some time now, but Ive never bought anything from them before. Then their Rose Golden Luxury Brush Set caught my eye and I decided to take the plunge. There's nothing like the thrill of new brushes, especially when they are as beautiful as these. 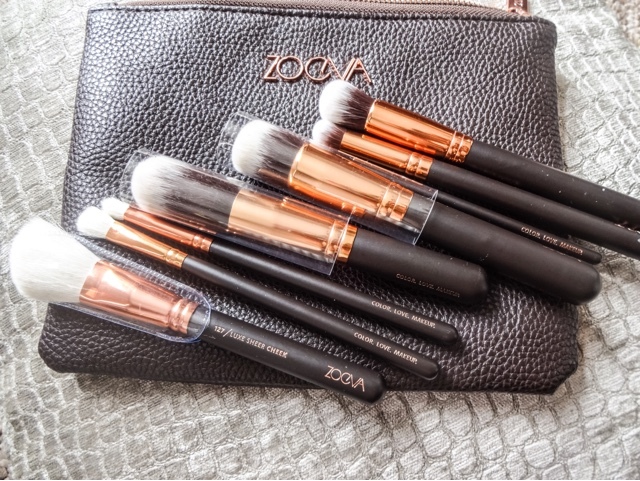 There are eight brushes in the set, and they come in a large pebbled leather effect zipped pouch with rose gold metal badge and zips. Its such a gorgeous way to present them, and I think the bag is stylish enough to actually use as a clutch. Its also a great way to keep the brushes and your makeup neat and tidy. The brushes are a very dark brown wood with rose gold metal ferrules and the bristles are a mix of natural for powders and synthetic for creams and liquids. They can all be bought separately if you don't want to splash out on the set. I'm going to do a fuller review on these so I wont go into each brush now, but on first impressions these are beautiful quality and do an amazing job at creating airbrushed perfection. I have wanted to get my hands on these ever since I read an article titled ‘The £7 moisturiser that's nearly as good as a £292 cream’! The product I really wanted was the mask peel though, and initially it was limited edition and gone ages before I knew about it. But when it came back into store I knew I had to try some, and I got the day and night creams as well. 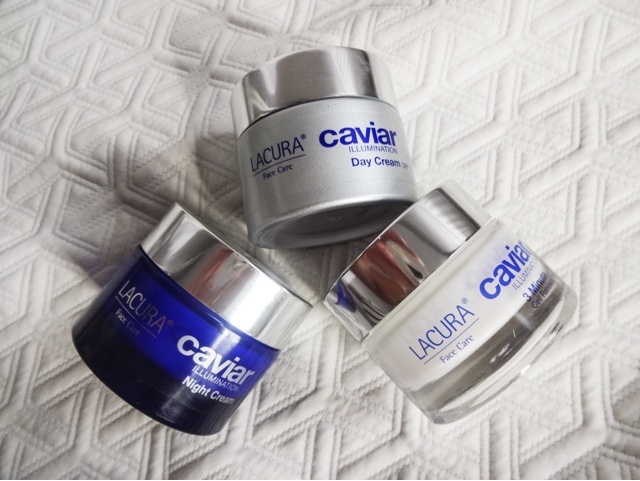 Each product contains caviar extract, which is rich in protein, vitamins and minerals that pep up the skin and is well-known as a powerful anti-ageing active ingredient. The heavy glass jars with silver lids certainly don't look cheap- they are clearly modelled after the La Prairie Skin Caviar range as the packaging and font etc are very similar. I've been using these for a few weeks now and they feel very luxurious indeed. Time will tell if they deliver good results but I am certainly enjoying them. Full post coming soon! Not even going to lie, this one was all about that drop dead fabulous tube. Would you just look at it?!? Its freaking insanely pretty. It gave me the eye in Boots when I popped in to get some baby items and I just could not leave the store without it. Its so dazzling and pretty and wow, I felt that just having it in my makeup bag would out a huge smile on my face. 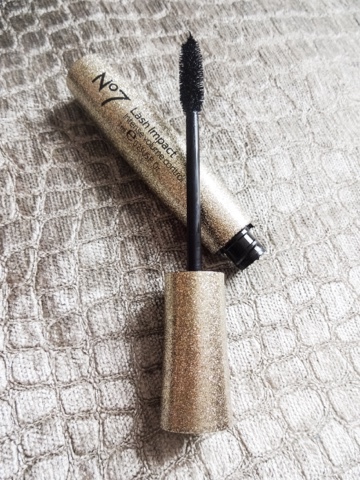 While I was whizzing round the store, I did some quick googling about the mascara on my phone and the results I saw convinced me I would probably like the actual mascara as well rather than just the show stopping tube. It has a thick fluffy brush and the before and after reviews I saw seemed to give a volumised, soft result. It seems to be a bit of a drier formula as well, which is my preference. I hate mascaras that are really wet and smudge everywhere, I always like them best when they're more dried out and about to run out! I'm hoping I like this, because although I adore no7 serum, Ive never really liked the makeup. Maybe this will change my mind! You may know this brand for their beautifully packaged nail polishes. Ive certainly admired those from afar, but I'm not much of a nail polish girl. I loathe painting my nails, so I just prefer to get gels done at the salon and leave them alone. But when I saw they'd launched a new range of lipglosses, I had to try one out. The formula glides on and gives a dewy, non-sticky finish. They're infused with portulaca pilosa extract (known for being skin-conditioning and plumping) and coconut oil, in a range of semi-opaque and shimmering formulas. They also smell yummy, and are paraben-free and vegan. The Queen is Dead (brilliant name) is a raspberry jam colour. 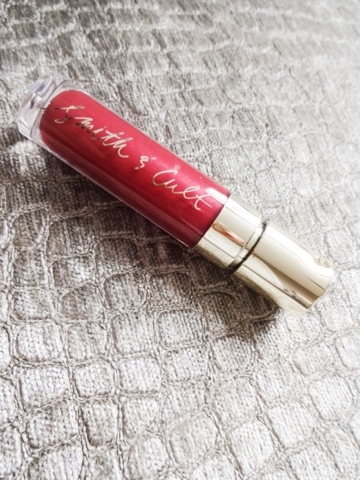 I picked it because I don't own anything similar in the way of gloss, and I absolutely love it on. Normally if I do darker lips they're in a matte lipstick, so wearing them as a gloss feels fresh and quite cool. The little tube is so pretty as well - a summertime clutch bag essential. At the start of the month, I placed an order from US lash boutique House of Lashes and I was so excited for it to come. Id been lusting after one of their Precious Gems lash storage cases for ages after spotting it on Instagram. As a lash addict, I like to care for my falsies properly, but good storage solutions are actually quite hard to find, and Ive never seen one as elegant as this! While I was there, I picked up a couple of pairs of their lashes too. 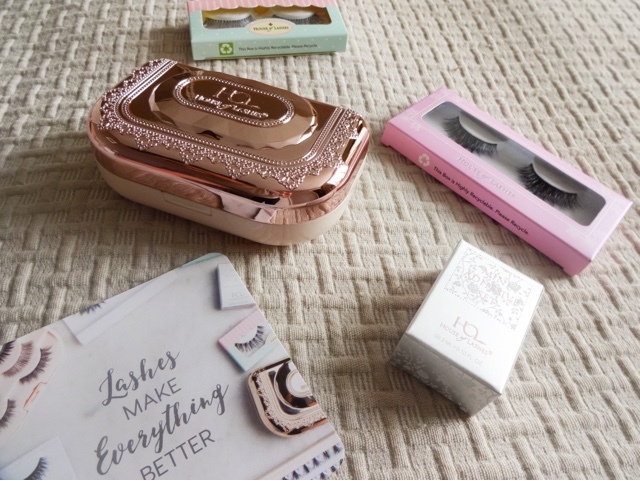 Au Naturale is a light, daytime sort of lash and Boudoir is a heavy but feathery style. I also got some of their Mini Lash Adhesive at the same time as tubes clip neatly into the lash case. Despite coming from across the pond, shipping was only five dollars and the lashes look beautiful, so I would definitely order from them again. So excited to do a fuller post on these. When I was in the city, I popped into Primark to check out the PS Pro line of makeup that has just launched. While it all looked lovely, nothing really jumped out at me so I didn't make a purchase from the range. But of course I didn't come out entirely empty handed -does anyone ever leave that place with zilch? 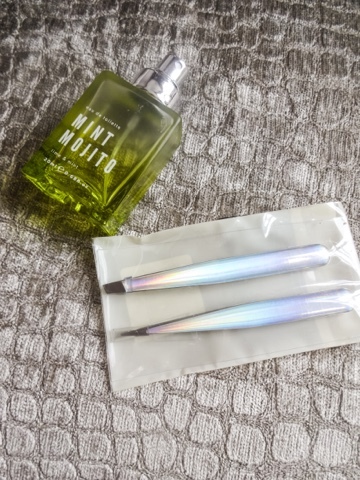 I spotted these rather pretty holographic tweezers and my inner magpie couldn't leave them behind. Theres a slanted pair and a pointed pair in there. I want to pop one of them into my new lash storage case so they're always with me, as my husband has a bad habit of borrowing my tweezers and losing them even though he has his own. Its always good to have a spare pair to take on holiday and things anyway. On impulse, I also picked up this teeny bottle of perfume. We were in the grips of hot weather at the time, and this just smelt amazing. Really fresh, but not too sugary. The perfect mojito smell! I really liked it and the little bottle is perfect for taking away or slipping into your handbag. Ok, so I actually got these a while ago but I hadn't shown them at all on the blog, so Ive popped them on here now. 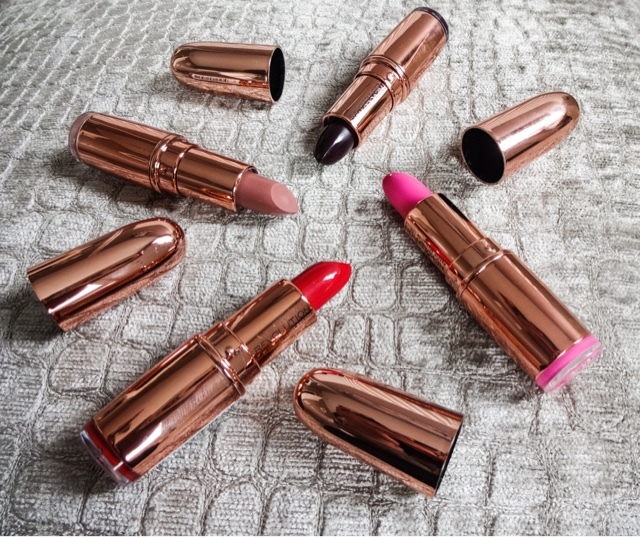 These lipsticks were massively popular when they launched and one of the shades in particular is pretty much permanently sold out!And at just 3 each I can totally see why. There are five shades, of which I picked out four. Two of the darker shades looked quite similar at first glance, so I only chose one. They all come in that beautiful metallic packaging. The shape and size of the bullets are pretty identical to Mac so they look amazing in my organiser next to all my Mac lipsticks. The formula is mid-to-sheer and quite creamy with a satin finish that's really flattering. I’ll write more about these later but they are definitely the best lipsticks I've tried in a drugstore range. So that's my little beauty haul for this month. What products have you been loving lately?